the movinginformationmachine [mim] is a movable, mobile monitor, camera and speaker unit, functioning as a central network node, which collects all the data from the whole installation [the playground] and monitors them back continuously. via various monitors, cameras and speakers the unit aims at a concentrated, both in the literal and figurative sense of the word moving audiovisual overstimulation. the physical assembly of the playback and recording devices is planned as a 3 dimensional plastic. no matter from which perspective the complex monitor sculpture is looked at - the date flow/overflow is guaranteed. the mobility of the sculpture is ensured by the montage of the whole unit on a track or suspension system in the space. additionally, the montage of single monitors, speakers, or cameras is such designed that these could be partly removed from the unit. thus a dynamic, agile, in form and content complex object is built that gives the impression of vitality and emotionality. an oversized, wildly expanding children's adventure playground that has grown to adult sizes and proportions, taking in elements of a normal playground and interweaving them in a connected mesh of ropes, balances, nets and swings. this playground form encourages the visitor to climb, to explore the possibilities of the well-known space. the objects are, however extended through a complex system of imaginary playmates: sensor systems note the effects of the visitor as they swing on a knotted rope, balance across a suspended pole. audio visual responses to these motions are played into the space, the echoes of other visitors playing, effects of motions and resonances of movement. the playground does not limit itself to av responses. the objects in the playground network are effected by actuators; pneumatic, motorised and otherwise. these effects echo the motion of imaginary play friends who are also using the space in another time and/or modality. so a visitor can bounce upon a cargo net in one place, then later bounce with themselves on the other side of the net. or with someone from the previous day. 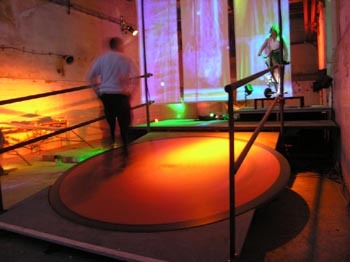 later developments of the playground will be integrated with the planned virtual space representation, allowing players in the virtual playground to be physically perceived by physical players and vice versa.